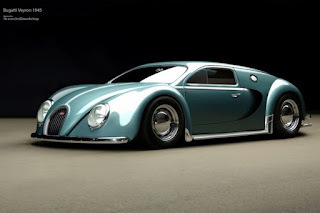 A 30 year old Polish artist from RC82 Workchop that fancies chopping, Formula 1, drifting, JDM's, jumbo jets, and skateboarding, had an eye for a beautifully rendered Bugatti Veyron/Beetle from VW that would have been made back in the 1940's. When I first saw this, I said to my self "Finally! Something stylish for our times." With the crome trim, big ol' bug eye headlights, the Beetle like wheels, and the back end straight out of the 40's, I'm sure this render will be seen all over the word within a months time.